Tamworth Castle is a Norman earthwork motte and bailey fortress, founded by Robert le Despenser. In the 12th century, Robert Marmion founded the stone castle, when he crowned the motte with an impressive polygonal shell keep and protected its entrance gateway, with a small square flanking tower. Inside the keep, is a delightful range of Tudor and Jacobean buildings, built around a medieval Banqueting Hall and a courtyard. A massive curtain wall with herringbone masonry, leads from the keep to the lower part of a late 13th century twin towered gatehouse. Flanking the bailey ditch, the gatehouse is all that remains of Civil War slighting. 4 miles north-east is Seckington Castle and 17 miles south is Hobs Moat. 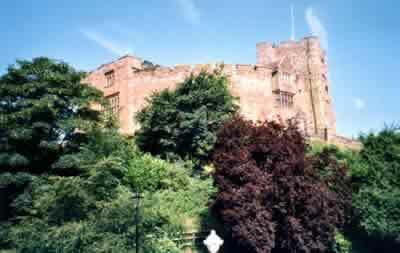 Tamworth Castle is located in the town centre, off The Holloway. 16 miles north-east of Birmingham, on the M6-M42-A5. The keep is owned by Tamworth Borough Council and is open, Tuesday to Sunday, Schools and Bank Holidays April to September 11:30-4:45pm, Saturday and Sunday October to March 12:00-4:15pm. The bailey is part of a public park.